How much do kids in high school know when it comes to personal finance? Alright fine, that's probably not true and a little too sarcastic to be a legit answer for such an important question. The lack of financial education that young people have IS a huge deal to me, and my short time (3 years) of teaching was eye-opening in that respect. Now, does that count as a Haiku because it doesn't mention nature? No idea. But essentially I paid off my $40,000 of student loans while I was a teacher and became really passionate about personal finance. I created this site and started teaching my band students personal finance lessons during our tutorial time. They loved it (I think). I wasn't really supposed to be doing that, but YOLO. When I did my exit interview after resigning, I told my principal that I had basically not taught any of the lessons that he provided every week and subbed them out with my own money lessons instead…and he thought it was actually a good idea. It was pretty clear that I had a passion for helping people with money in some way, so when I left teaching to run this site the majority of people were pretty cool about it. The unfortunate part is that kids in high schools are still woefully undereducated when it comes to all things money. They all WANT to be wealthy and avoid the struggle that their parents went through, but the tools simply aren't there right now. So I think we should at least open up the dialogue on what kids need the most in high school to be financial successes before we can really do something to change it. BOOM. The children need to learn about budgeting – statistics don't lie right!? So where do you start and how do you make it fun? Does this mean you don't teach them about taxes or investing at all? I don't know yet, but again…this is about starting the conversation in the personal finance community. You may be wondering…what do I actually think the most important financial lesson for young homies is? It's not budgeting, because I'm probably the only financial blogger out there that doesn't use a budget regularly and managed to be debt-free and a semi-success. I'm not saying they aren't important…I'm just weird and haven't used one. I really think budgeting should be reserved for the freshman year of college or senior year of high school because it takes more discipline than average 15 year olds generally have. Buy assets instead of liabilities. This is a concept from Robert Kiyosaki's book – Rich Dad Poor Dad. I like it because it's simple enough for high school kids to understand without making them bored. If every person in America could get this concept…my goodness it would be awesome. Use your extra money to buy things that will make you more money instead of things that lose value. For example, Millennial Money Gal and I will buy a commercial real estate property (asset) before we buy a house (liability according to Kiyosaki). Sounds crazy and unorthodox, but it will make our money work for us in a huge way! It would also keep kids from buying new cars and financing crap that they don't need or won't help them build wealth. 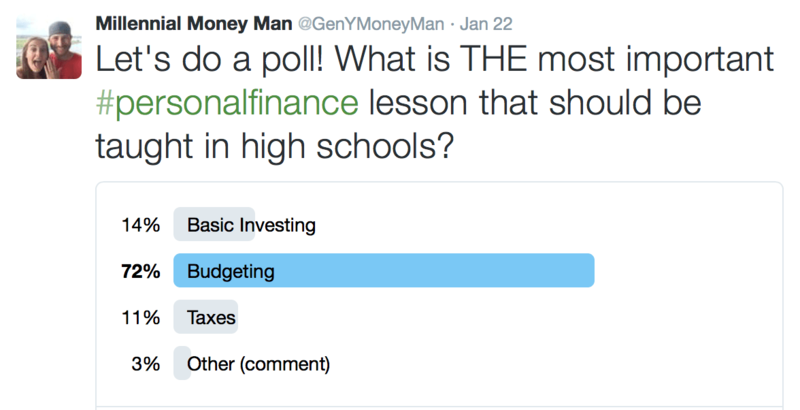 What financial lesson do you think is the most important for high school kids, and what grade do you teach it? Our 18yo son has been pretty mindful with his money since he started working a few years ago. I wondered if my plans to early retire (in April @ age 49) was setting a bad example for him – lacking ambition or viewing work as a negative – but he insists that he thinks I am a role model in this way. He is already pretty conversant in the 4% rule and thinking about how he could reach FIRE ten years sooner than we are! Budgeting – particularly paying yourself first is the essential skill. This brings up a great point – how much of this SHOULD be on the parents? In an ideal world – everyone would do what you are doing because it’s awesome. What I found is that a lot of parents didn’t talk to their kids about money at all. How do you reach the kids that have no foundation from their parents and convince them that budgeting (15 year old kids will hear “cutting out things you want”) is essential and the best thing for them? I agree with you – repetition is key. My experience in Texas was that there was very little to no financial education, with the exception of a “money-matters” class that seniors took as a blow-off. New legislation was just introduced last year, so maybe that will change! The problem I have with our system is that I have used more money than algebra since I left school, and the vast majority of kids will too. It needs to be just as important as the core subjects in my opinion. It is a skill that they have to use every day for the rest of their lives that goes far past basic math. Oh gosh, I have so many thoughts about this. Such an important topic. I actually don’t budget either. Instead, I just try to spend $0. Or I guess you could say my budget is $0, and I inadvertently end up going over it a little each month. 🙂 But I do think budgeting is probably a useful concept to teach, so that kids can decide whether to use it or not, or *how* they want to use it. 1. I would have thought “financial education” was code for “a math class for people who are bad at math” because that’s the only context where I had ever actually seen checkbook-balancing or budgeting exercises: these were tasks out of elementary school textbooks, or in remedial high school textbooks. Whereas I was good at math, and proud of that fact, and I would have been insulted if someone had tried to tell me I needed to sit in a class to learn how to add and subtract numbers in a column. 2. I had an unfortunate misconception that only poor or very low-income people needed to bother with budgeting, and that if you had any type of decent-paying job, all that stuff would take care of itself. And I assumed I would always have a decent-paying job. Yeah. Again, a very, very unfortunate misconception. So, I think it’s tough. I would have needed a class that effectively busted both of those myths. I think the only way I would have been interested is if the course had a really snazzy name, like “How to Get Rich!”, haha. But I do think that if there was a class, senior year of high school would probably have been the best time to introduce it, since I was at least on the cusp of a transition. Great post! 🙂 Apologies for ten-page long comment. *Whew* – I seriously thought I was the only blogger that didn’t have a regularly used budget. My wife and I just try not to spend very much, and it has worked very well for us. As I’ve thought about it more – senior year may not be the best time like I thought it was. Once seniors get to the second half of the year they start coating and develop the dreaded “senioritis”! Junior year is typically when they work the hardest and care the most. Thanks for sharing your thoughts Sarah! I feel that teaching a lesson on opportunity cost would be a great place to start with high school students. I teach high school social studies, and we often discuss the opportunity costs of going to college. At what point does it become more beneficial to start working right out of high school vs. going to school? At what age does the college grad “catch up” to the kid who worked right out of school. Questions like these are the ones that make for great discussions for students, and really get kids to think about the alternatives to every aspect of their finances. I LOVE that idea, Kyle. Your students are lucky. I never really thought at all about why I was going to college, or what college had to do with finances, or how to analyze things like opportunity costs or break-even points. It’s pretty cool that you fit that into your curriculum. Kyle – number 1, you are a [email protected]$$ for being a teacher and including personal finance into your lessons. Just had to get that out of the way. Opportunity cost is an incredible tool for finding the value of college. I honestly believe that we will see a slow shift back to jobs in the service industry and an increase in apprenticeships with plumbers, electricians, welding, HVAC, etc. And really – our country NEEDS those jobs badly and they can pay really really well. Keep fighting the good fight brotha and thank you! We don’t budget either! Maybe that’s because we track every cent we spend. I had a budgeting professor in grad school, who did away with the curriculum for one day to teach the basics of buying with cash, not credit cards, how to run a balance sheet and keep tabs on what’s in your checking account, etc. She was amazed students got into college not knowing the basics about money. I remember as a kid, watching my parents sitting down at the kitchen table to “do the bills” and thinking to myself how complicated it seemed. Little did I know. That’s so funny, my parents sat down at the kitchen table to do bills when I was a little kid and it looked crazy! I never asked them about it. Here’s a crazy fact – I didn’t even write my first check until I was 25! I think one of the most important financial lessons for high schools students is the concept of paying bills. I think it could be easily demonstrated, too. If you want this house [show picture of a big house], you have to pay this bill [show insane mortgage amortization schedule]. Then, explain to students that over the course of 30 years, they’ve paid 3x what they can actually sell the house for. Go commercial real estate! 🙂 Looking forward to hearing about your plans. That’s a great point. I think a lot of kids (and adults) don’t realize how much of your mortgage payment goes towards interest in the first half of the term. That is why I side with Kiyosaki on houses being liabilities (don’t tell my accountant though)! What if you took that down payment and bought something that could make money for you? I’ll keep you posted on the commercial RE – we are looking at buying a storage facility before the year is over. I’ll do a blogging series on it, because I don’t think people realize the type of returns you can get when other people pay down your equity on a property like that. I’m with you on not needing a budget…not that this is for everyone, but budgeting hasn’t been necessary for us, after the newlywed transition. I think your choice of assets vs. liabilities would be really important, and I’d teach it to 11-12th graders (the grade I used to teach). Compounding interest is also important, but I think it’s a little too far removed for most students to care. I did warn my students about student loans, too. I agree – my wife and I haven’t needed a budget, but as our finances get more complicated maybe we will be? Not sure yet. It really needs to be split among budgeting, credit cards and some minor investing. At the very least, we need to stress the importance of starting early on your retirement savings. In the end, if you can only teach one, I say budgeting. Proper budgeting will help alleviate the need for credit cards. Though I honestly think cards are relative straightforward: You charge something, then you pay on time & in full or you pay heinous amounts of interest and may never get out of debt. If it was up to me we would have required financial curriculum that would be included with math. Personal finance is a super simple math problem (in most scenarios), and there is no reason why we can’t have teachers do a lesson or two every semester just to brush up on the basics of credit card debt, student loans, how to pay bills, etc. I agree with you – proper budgeting would get help curb the reliance on credit cards. Picking one topic is tough, but that’s what makes this fun! Great article! When I have done financial training in both Junior High and High School, it is very well received. Students like the idea of planning ahead. I think they have witnessed the challenges of debt and money struggles in their own homes. It’s encouraging to see them want to change the pattern in their own life. Keep up the great work! Glad you liked it! That’s the thing I always noticed about kids…they want the tools to become financially free just like the rest of us. Glad you are doing financial training for the kiddos! Great topic! I would tell 18-year-old me the following things. 1) Your friend turned down an Ivy League because she got a full-scholarship elsewhere. Instead of secretly judging that decision, slap yourself in the face and realize it was really smart and you should be thinking like that too. 2) Review all of the loans you will be taking out, understand them, and at least come up with a plan to pay the interest on the loans while you’re in school. 3) Don’t wait until senior year of college to realize that you should be working and saving while you’re in school. You have a friend working at a grocery store while taking classes in order to save up money. You should be doing that too. I wish I had realized I should make payments on my loans while I was in college. I worked 2 jobs, but used the money to do fun stuff instead of being responsible. Probably could have cut down my loans by at least $10,000!!! That is about right. I did not start thinking serious about money until my 30’s. I did not have much money in my teens so, money was an after thought. I am more concerned now. Imagine what you could have done if someone had gone out of their way to make it important in your late teens or early 20’s! Great blog. Nice to see you teaching the younger generation how to manage their finances well. man are we ever lacking in that area as a nation. Also, way to go on getting rid of that student loan debt. Must have been a big weight lifted off your shoulders. Imagine if high school student started accumulating assets instead of debts/liabilities, where they would by the time they start working. Wish I had such wisdom growing up. no such luck though. However, managed to pay off my student loan as well. Great blog. Great story. I’m only 23 and I took an optional personal finance elective my junior or senior year in Highschool. I remember learning how to do taxes and how to budget. It was really beneficial for me, but I didn’t take it as seriously as I should have. I really think this should be a standard class everyone has to take in high school. You don’t always learn it at home. My parents are horrible with money, and while I had a job in high school, worked full time during college, and was lucky enough to get a very well paying job after I graduated, I still have 7k CC debt (currently interest free!) and 58k in Student loans (down from 70k one year ago). Between the ages of 16-22, the money I earned went towards more or less pointless things I didn’t really need. I wish I would have paid interest on my student loans while in school, and put more into savings or investing as well! I think Personal Finance in all aspects really needs to be stressed about more and discussed more often with people who are 16-25 or 30. I am part of the Facebook group and seeing posts on there is just a daily reminder for me to be conscious with my money and to keep paying down my debt!